The Dutch are known for their outspoken way of communication. They are even called ‘blunt’ at times. What a difference with the Arab World! Let’s have a closer look at this region. The Arab world includes 22 countries and about 400 million people. It’s a large region, with distinct differences. Oil wealth versus economies in deep trouble, heavely populated countries versus scarcely populated ones, (nearly) mono- religious versus multi- religious countries. However, when it comes to culture, there are things we can mention in general terms. One of them is that Arabs are eloquent and hospitable people. And relationship is of utmost importance. Building a relationship takes time and efforts. However, these efforts can be rewarded by a longlasting and genuine relationship or even friendship. The fact that these societies are focused on relationships, reflects on the way of communication. Where the Dutch say everything they (want or need) to say, Arabs leave out most. This means you will need to read between the lines. ‘What’s not being said?’ That’s the question. Saying ‘no’ is surely not preferable. This also accounts for business. 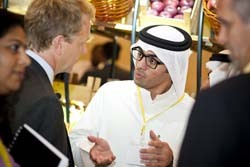 For example: when invited to present your product to an Arab company, they will be interested to learn more about it. After you made your offer, you will be informed that you will hear from them. What if you don’t hear back? Also after you –reluctantly- contacted the client? Probably, the client mentioned something like: ‘we are still considering’. After a few times, you need to conlude for yourself that this probably means ‘no’. Don’t ask for a clear ‘no’ because you won’t get it. Remember: relationship is important and you wouldn’t want to ruin it by saying blunt things like a straight ‘no’. If you can accept this and work with it, you will enjoy your contacts with the Arab world. As anywhere, communication is the key, also in the Arab World. You just need to learn how. This post first appeared on KIT Intercultural Professionals’ Blog.